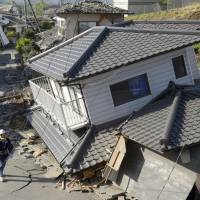 KUMAMOTO - As Kyushu residents attempted to get through a sleepless night, another strong earthquake rocked Kumamoto early Saturday, killing 32 people and injuring more than 900, bringing the combined death toll from Thursday’s quake to at least 41. The magnitude-7.3 quake hit at 1:25 a.m. and registered upper 6 on Japan’s seismic intensity scale of 7 in Kumamoto Prefecture. 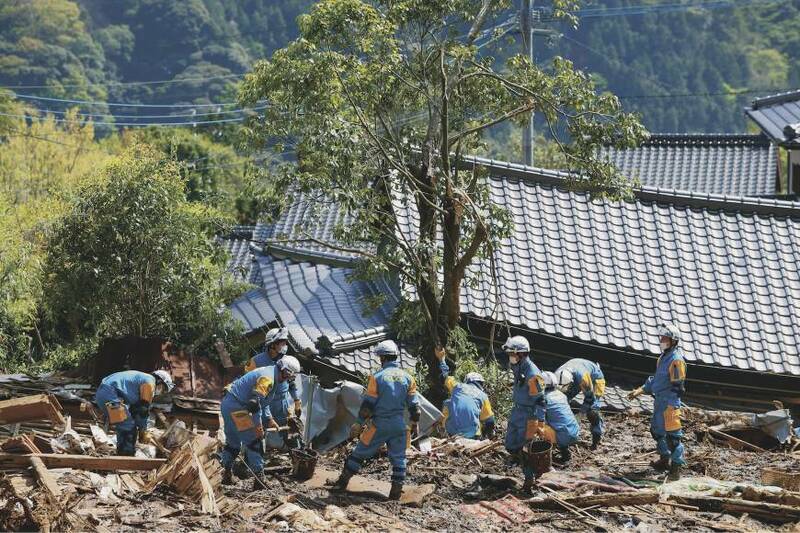 It was more powerful than the temblor that barely a day earlier killed nine people and left more than 1,000 injured in the Kyushu area, according to the Meteorological Agency. As reports came in of people trapped in collapsed buildings, fires and power outages, authorities warned of widespread damage. Heavy rain forecast for the coming days could lead to more landslides and weaken already damaged structures, the agency said. 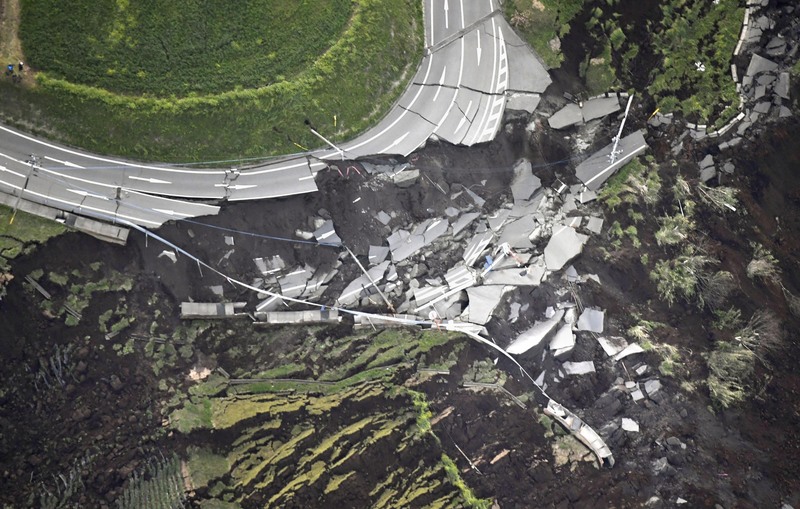 The powerful shaking triggered a landslide that swept away homes and cut off a national highway in Minamiaso. 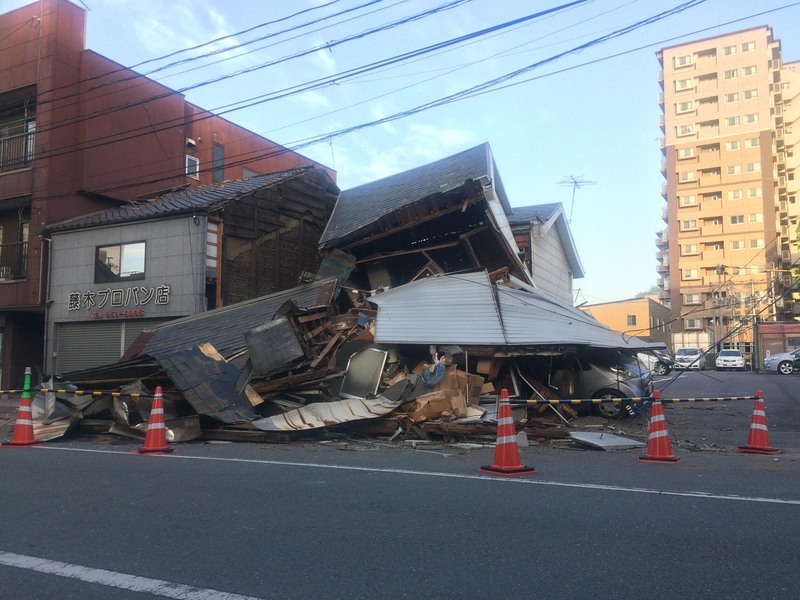 Unlike Thursday’s quake, which mostly damaged old houses in the town of Mashiki, newer buildings also took damage and some collapsed. The quake, which saw its preliminary magnitude upgraded from 7.1, originated at a depth of about 12 km and is now believed to have been “the main quake,” rather than the ones that hit Thursday night, which are now considered foreshocks, the agency said in a news conference early Saturday. 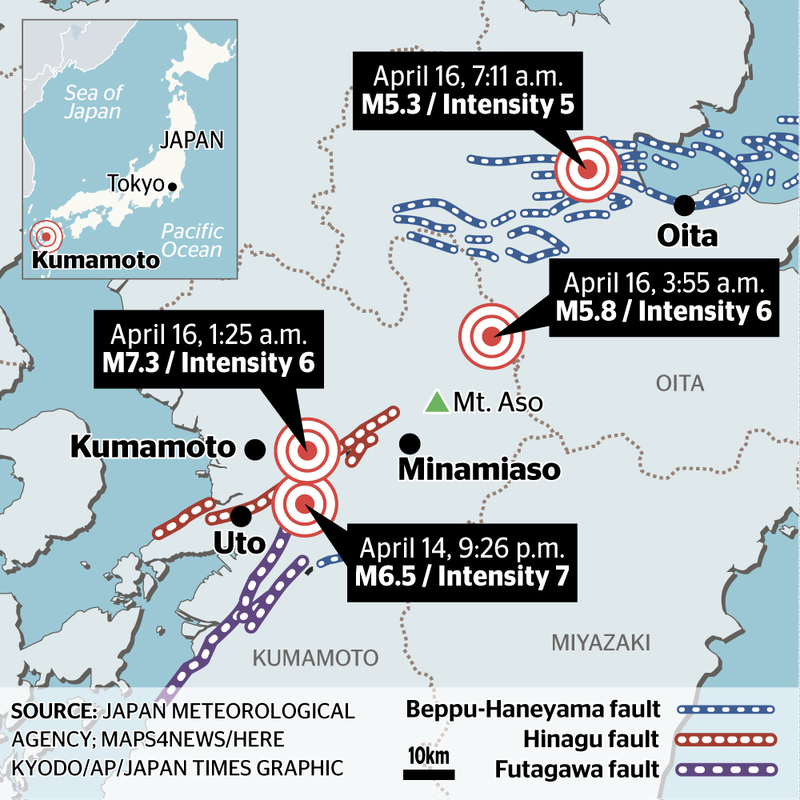 The quake’s magnitude of 7.3 matches the 1995 Great Hanshin-Awaji Earthquake, and its epicenter was described as the area around the city of Kumamoto. 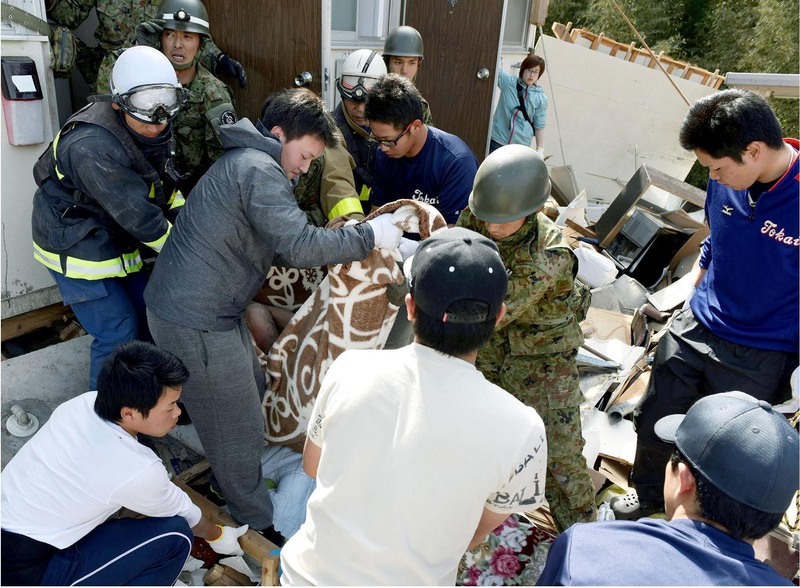 The Kumamoto Municipal Government said four apartment buildings near Tokai University’s Aso Campus collapsed and 11 people including students are believed to be trapped under the wreckage. Local police and firefighters are trying to rescue those buried in the rubble, but two students were found dead, the university said. In Chuo Ward, the city’s busy shopping and restaurant area, the powerful quake Saturday morning caused strong sideways shaking, knocking down lockers and shelves at stores and hotels. Soon, the area was filled with the sound of fire alarms. Police officers made sure to shut down several passages in a shopping arcade where the rooftops were falling apart. 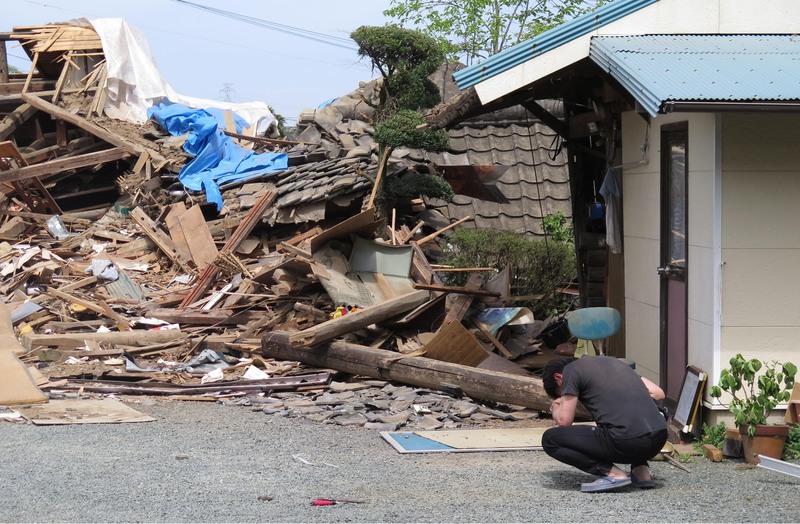 “I believe this quake was even bigger than the first one,” a man who only identified himself by his surname Ueda said Saturday. He said he evacuated from the control room of a multistory parking garage he works at. “Look. The cars are about to fall off. I don’t want to get stuck here,” he said, as his phone started warning of potential aftershocks. Seeking open space, many residents fled to Karashima Park. “I jumped out of bed after the shaking,” said one evacuee who only identified himself by his surname of Wakamatsu. He had just moved to Kumamoto for business this month, leaving his family in the Kansai region. “I didn’t know where to go, and since I’m by myself it was very scary to walk outside in the dark. “I couldn’t sleep for a couple of days, and I had no sleep today. But there are many more things to be cleaned up (around my office) now,” he said. 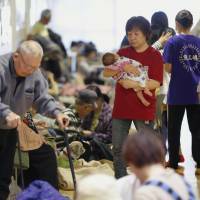 Elsewhere, about 700 people had evacuated to the Mashiki Health and Welfare Center, the biggest evacuation center in town, on Friday night. Some evacuees said they lost their homes. 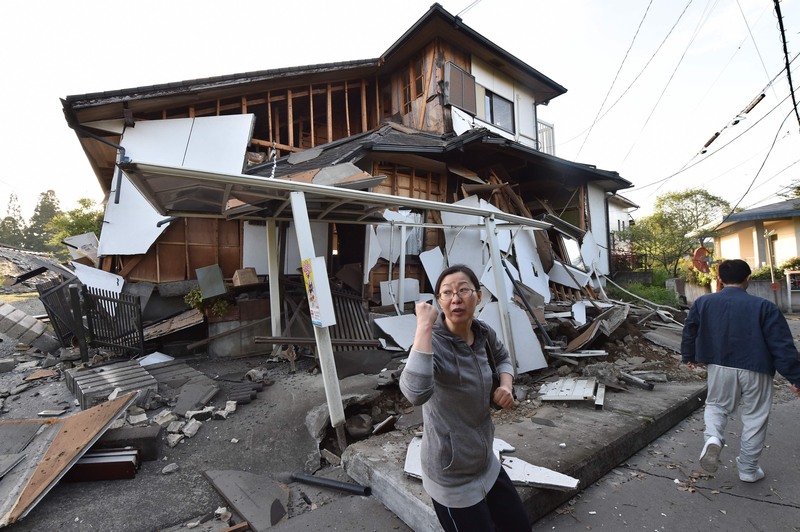 “The second floor of my house smashed the first floor,” said Eiko Hirai, 61, explaining that her entire house collapsed. She said she thought earthquakes would always hit northern prefectures like Ibaraki, where her child lives. She said she always worried about the child, but this time it’s the other way around. “I don’t know what to do now, and I don’t know if it’s possible, but I’d like to build a house once again that my child can visit,” she said. According to the Kumamoto Prefectural Government, one person was confirmed dead in an apartment fire triggered by the quake in the city of Yatsushiro. 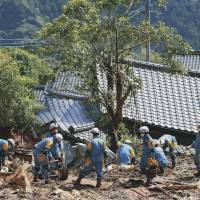 Thirty-one other people were later confirmed dead in Kumamoto, the village of Nishihara and elsewhere while more than 1,000 were injured. 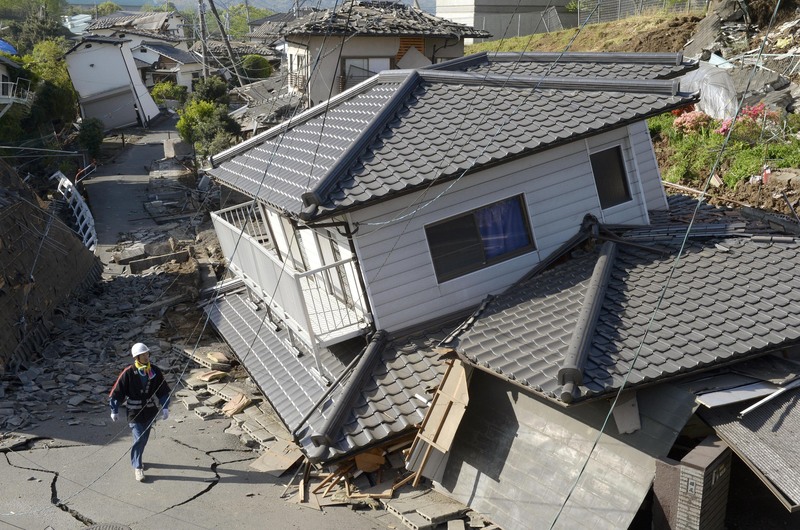 The damage caused by Saturday’s quake and others in its wake has included collapsed houses, landslides, blackouts that have left more than 200,000 households without power, and water outages in 385,000 homes across Kumamoto, Oita and Miyazaki prefectures. 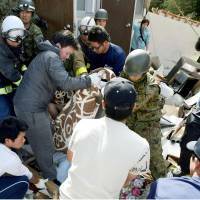 At least 500 people were treated at hospitals in Kumamoto Prefecture and neighboring Oita, where a quake was reported to have caused several injuries from collapsing houses in Yufu, a well-known hot-spring resort town. 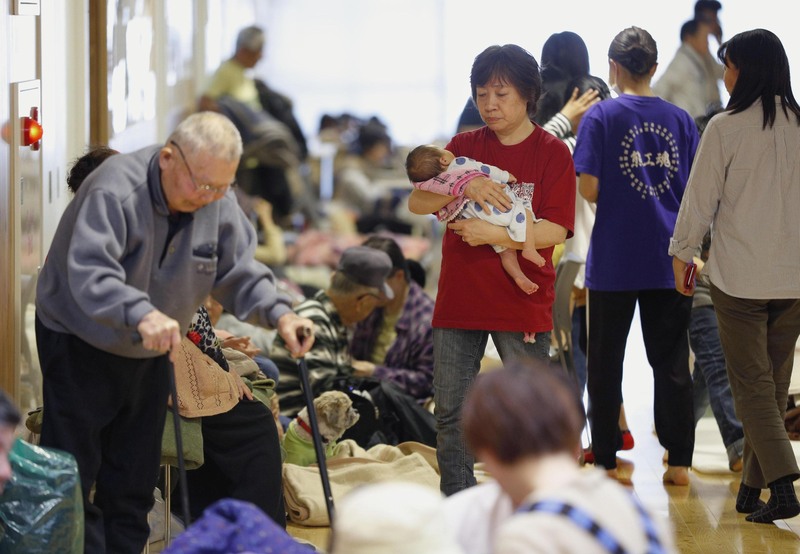 As of 2:30 p.m., about 91,763 evacuees were at 686 shelters in Kumamoto Prefecture, according to the prefectural government. The ceiling of Kumamoto Airport’s terminal building collapsed but no injuries were reported. All flights in and out of the airport have been cancelled. A small eruption was detected near Mount Aso at around 8:30 a.m., but the Meteorological Agency said it had not concluded whether it was linked to the temblors. 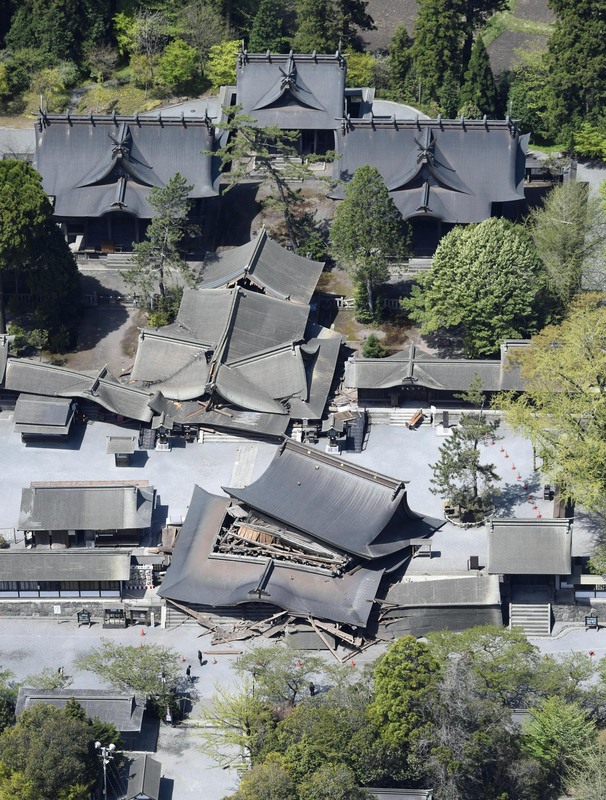 Chief Cabinet Secretary Yoshihide Suga said at a news conference Saturday that significant damage is feared from fresh quakes and that the central government will make maximum efforts to respond. Suga said no damage to the nuclear power plants in Kagoshima and Saga prefectures had been reported, but added that Prime Minister Shinzo Abe canceled his trip to Kumamoto for Saturday after the new quake hit. Defense Minister Gen Nakatani said the ministry will dispatch up to 25,000 Self-Defense Forces personnel to Kumamoto for rescue operations on Sunday, with 5,000 more than initially planned, he said. At an emergency meeting Saturday, Abe said the government will mobilize all available resources to cope with the situation. The quakes struck as rescue workers on Friday were continuing the search for survivors from Thursday’s magnitude-6.5 quake, which was the first in Kyushu to hit 7 on the Japanese intensity scale, and the first in the nation to reach that intensity since the offshore Great East Japan Earthquake on March 11, 2011.